Anne of Green Gables was published in 1908. In 1985, red-headed Anne graced the small screen with a wildly popular television mini-series on PBS. Anne is back again with a Netflix series, Anne with an E, that is a mashup of the Anne we all know and the talents of Emmy-winning writer Moira Walley-Beckett (Breaking Bad). We just can’t seem to get enough of Anne! Anne Shirley stepped off a train in picturesque Prince Edward Island and was a cultural icon. She was a smart outsider whose grit and imagination exemplified love, inclusiveness, and determination. And many a young girl dreamed of finding their own Gilbert Blythe. 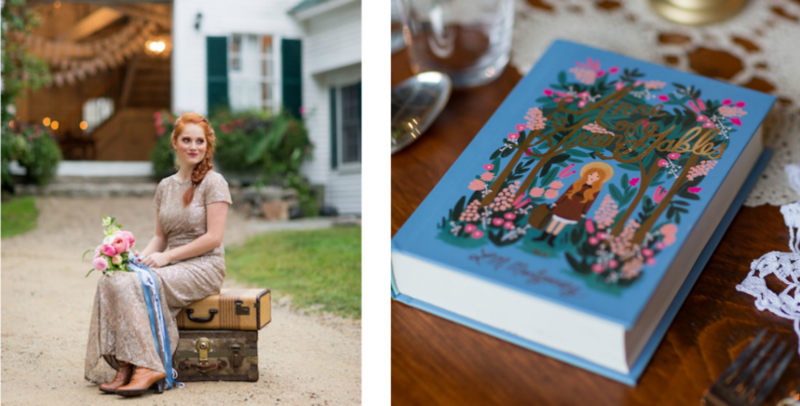 The novel got a lovely cover redesign by beloved Rifle Paper Co. and that was the inspiration behind this special Anne of Green Gables Wedding shoot. Kristin Burgess, from Emily B., styled the shoot. She drew inspiration from the new cover art but she also went back and watched the 1985 miniseries. She chose and arranged the flowers herself to almost perfectly match the new book cover. She also took suitcases from her own personal collection of vintage suitcases as a nod to orphan Anne at the train station. For the dress, Kristin wanted something that would be non-traditional and understated but still beautiful. She found a fun dress that met all her criteria. The wedding photographer, Meg, from Rodeo & Co., grew up an Anne of Green Gables fan and she loved how the whole shoot came together so organically. Her friend, Mallory, was the perfect red-head model and she felt the fishtail braid by Debony Salon was impeccable. The Barn at Hardy Farm captures the Anne of Green Gables and Prince Edward Island vibe. The romance and simplicity are in all the small details. The starkness of the barn, the elegant tables and chairs and the beauty of the gardens made a scene Anne would love. Kristin pulled in a lot of lace. One of everyone’s favorite details about the day was how they didn’t have shoes for the bride and Meg’s mom who was attending the shoot donated hers. “Those boots were the best!” Kristin said. I think everyone agrees scrappy, smart Anne would have totally appreciated the loveliness of the boots from a happenstance. As Anne goes on to inspire another generation in Anne with an E, we wanted to take a few minutes to remember one of our favorite shoots. You can view the whole gallery of the shoot here.